Over more than a decade serving the retail software needs of the UK Rail industry, Tracsis’ software has become the industry standard. We work closely with our users to ensure that our software meets their unique requirements. Tracsis Retail software is used right across the operator’s business, from the ticket office window to the boardroom, covering all aspects of the retail and accounting experience. Staff performance, revenue analysis, cash reconciliation and barcoding are just some of the processes that our software expedites for our customers. This is a period of significant change on the retail front, and we’re working with our customers to add yet more functionality to our products to help integrate the many new technologies that are sweeping through the industry. Please don’t hesitate to get in touch if you have any requirements which you feel could be addressed by our collaborative approach. Data analysis to assist in the development of marketing strategies and their effectiveness. Tracsis Office is a retail information hub. 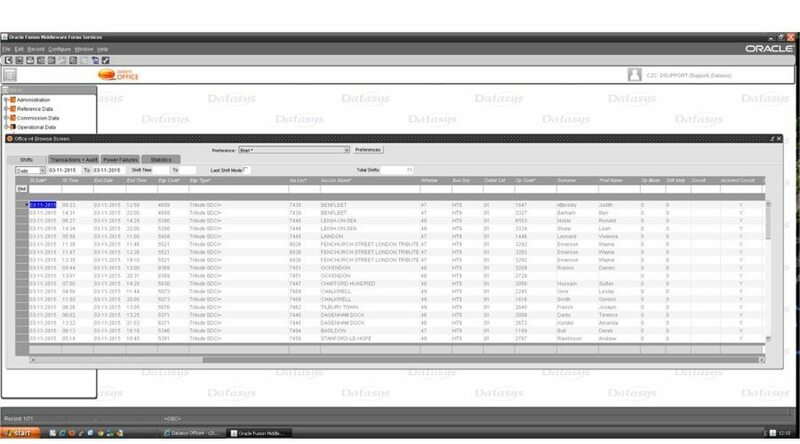 Industry standard sales data can be fed automatically into Tracsis Office any Ticket Issuing System (TIS). In addition, Tracsis’ collaborative approach with users has enabled us to be instrumental in encouraging TIS manufacturers to produce a feed of audit event data (Printer Errors, Power failures, etc) which our customers find invaluable both in terms of Fraud Prevention and Equipment Performance monitoring. Tracsis Office is the only place where you will find this audit information merged into the sales data from any given shift, thereby providing the complete ‘story’ of the shift. Tracsis Office offers completely configurable access to the data in its bespoke database. For example, some users can be configured to see a single location only, or group of locations whilst others can see it all. This coupled with an unmatched level of data retention makes Tracsis Office indispensable to your business. An essential resource in almost all Train Operating Company passenger accounting teams, Tracsis Accounts can receive data from multiple sources to prevent manual input of data. Accounts streamlines the end of shift, day and period processes and provides comprehensive retail accountancy information through a set of reports including Surplus and Loss, Barcoding information and machine reconciliation. The new, innovative SmartSafe functionality, provided as an integral part of our Tracsis Accounts Retail Software System, benefits Train Operators by creating a smart interface with the coin and cash solutions currently offered by your SmartSafe provider. This new functionality works by capturing the data processed by your SmartSafe in order to quickly and accurately reconcile the amount of money taken by retail staff at the beginning of their shift and the amount returned at the end of their shift. Tracsis Cash Rec takes cash banked information for thousands of shifts over the Train Operator’s entire network, compares it to corresponding records from the cash processing company and automatically closes as many shifts as possible, allowing the Accounting team to focus on exceptional cases. We’ve recently overhauled the Cash Reconciliation processing and user interface to provide even greater flexibility around the level of automatic shift closure, giving the Accounting team complete control. Acumen is our custom-built reporting platform. 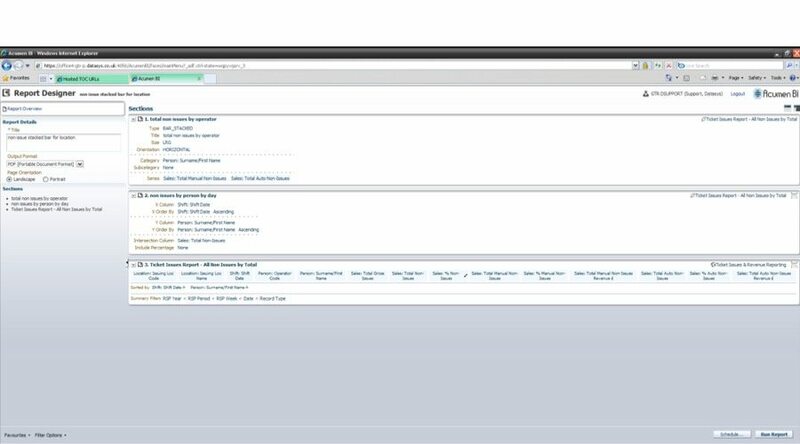 It can be configured to sit on top of any data and allows users to access pre-configured reports, or build their own. A full suite of graphs and charts is available to the user. Once a report is built, it can be scheduled to automatically arrive in the email inbox of any number of recipients. 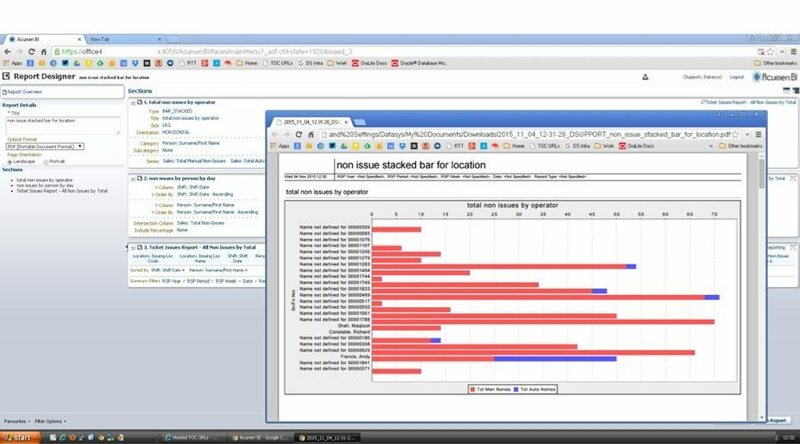 Just like Office, each of the recipients can, if required, have their own customised view of the data. Using this technology, it’s possible to schedule a report for the entire organisation in one action, and each recipient will see only the information that is particularly relevant to their needs. “We are only four periods in to using Tracsis Accounts and we have already realised a number of significant benefits. The percentage of shifts that are auto-reconciling using the Cash Reconciliation functionality has meant that the Station Accounting team’s focus has moved from manual input to a more risk-based approach, checking exceptions and providing better Management Information to help and support the business. We expect to realise further benefits as we progress such as detailed, more automated reporting and being better able to use this time to focus on further business improvements.